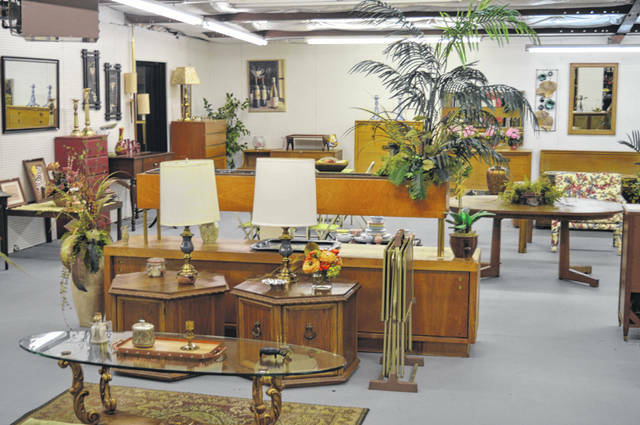 The new Caesar Creek leaders’ target customers are those who are very focused on doing nice things with their home and love finding a bargain. Pictured is a space in Market 2 that is part of Your Community Store — which has a Wilmington operator. Merchandise at Caesar Creek ranges from miniature cars to lawn-and-garden, from baby supplies to bamboo items. On July 16, Darrell Petrey of Your Community Store, left, and Mary Burr, third from left, presented a $500 check to the Clinton-Massie school board. From left are Petrey, David Webb, Burr, Andy Avery, Chris Harrison, Mike Goodall and Jeremy Lamb. 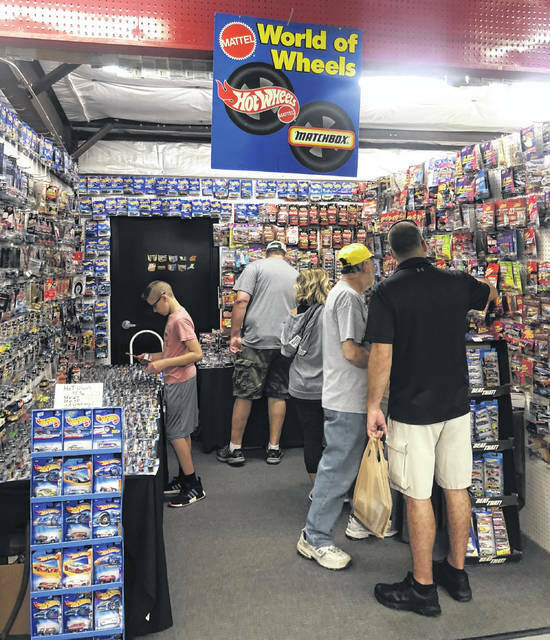 CHESTER TOWNSHIP — Caesar Creek Flea Market has a new CEO, a new general manager and a goal to turn Caesar Creek into a decorator home shopping destination. Bell was one of the leaders of a turnaround at Big Lots where they grew from 200 stores to 1,500 stores. He was the number 2 executive there, serving as vice chairman and chief administrative officer. All told, he has a background of 30-some years in business growth. “I just enjoy putting a team together and changing the whole look of a retail concept, and then raising the revenues by improving the customer experience,” said Bell. He started on the job for this latest business transformation in mid-May. Mary Burr, whose background includes the Xenia Chamber of Commerce, was his first key hire when she was named the new GM. Their first focus, he said, is vendor recruitment. Caesar Creek Flea Market was slow to recover after a 2012 fire, said Bell. “Mary and I are very focused on filling the market up with vendors,” he said. As for shoppers, they’re specifically targeting grown Millennial women who are very focused on doing nice things with their home and love finding a bargain. The State Route 73 flea market facility has seven wings connected by one main building, and they’re calling each building a market. Almost everything now in Market 2 is a concept of Your Community Store which is the retail component of We Help Others (WHO). WHO is run by Wilmington-area resident Darrell Petrey with an aim of redefining fundraising. The basic idea is for residents to donate unwanted items to Your Community Store which then will convert the items into cash for the donor’s chosen local school district. Bell said Caesar Creek Flea Market and Petrey’s Your Community Store will be asking local schools to reach out to parents in their district to donate salable merchandise so that a portion of the profits goes to the schools. Bell likes the idea and said one of the first things he did after coming on board with Caesar Creek was work out an agreement with Your Community Store and Petrey. Market 2 at Caesar Creek is a concept of Your Community Store, and Market 2 is focused on home decor, Bell said. The plan for Market 3 is to be a peddlers market and to be home-oriented. Another building at Caesar Creek will have hardware, automotive items, lights, outdoor equipment and so forth — more male-oriented than some buildings. “We’re trying to be kind of like a department store, making it very shop-able for people,” Bell said. There are changes as well occurring to the outdoor operations. Outdoor vendors used to be in the big parking lot toward I-71, but Bell and Burr decided to move things to in front toward Route 73. That includes moving the outdoor stage and picnic tables, along with the food trucks. “The whole idea is to make it more of a festival, fun, family feel,” Bell said. They are trying to have some type of entertainment or event every weekend. One upcoming event will be a back-to-school celebration on Sunday, Aug. 12, he said. The new Caesar Creek leaders are still in their early weeks in their new positions, and of course not all their plans have been carried out yet. But the outline of the strategic initiatives, he said, is to first build the team, second build the brand, then improve the merchandise mix and then build sales. Caesar Creek Flea Market is open 52 weekends a year from 9 a.m. to 5 p.m. Saturdays and Sundays. It opened 40 years ago in 1978. Bell also is president and CEO of Treasure Aisles Flea Market of Monroe, Ohio and Dixie Twin Drive-In in Dayton.